Retired General Martin Dempsey on the lessons he learned from his Irish grandmother. Bridget Jennings was my diminutive, Irish immigrant grandmother. In 1922, as a 16-year-old, she left her parents and siblings in County Mayo and came to the United States. At 21 she married John Devenney of County Donegal, and at 41 she was widowed. I was her first grandchild. Both my parents worked, so she became my babysitter, close companion, teacher, and mentor. Like many grandchildren, I considered my grandmother my hero. She was a woman of great faith. In her clipped Irish brogue, she would rattle off the Rosary with unbelievable fervor, speed, and precision. One of my earliest memories is walking with her through the streets of Bayonne, New Jersey, my small hand encased in her iron grip so that I wouldn’t bolt into the street. She taught me scores of Irish ballads and delighted in having me perform for her guests in her small parlor. At her side, I learned that I was Irish, Catholic, and American. In that order, of course. Grandma Bridget was the matriarch of the family, and she dedicated herself to fulfilling her leadership role. She instructed us in all things, from religion to history to politics. Although we lived in an almost exclusively Irish American neighborhood, she insisted we meet and respect people of other races, religions, and ethnicities. She gathered her family each Sunday, and each of us felt that we were surely her favorite grandchild. From her, I learned that a sense of belonging is the greatest gift anyone can give someone. • You should give respect if you want respect. • The less said in anger, the less mended. • Be the person you’d like others to be. • Rich or poor, we all pull on our pants one leg at a time. • Build more bridges than barriers. • You’ll be known by the company you keep. • You make your own luck. • We learn more from compliments than criticism. • Effort doesn’t always produce excellence, but it’s the start. • You only get one chance to make a first impression. • If you listen to people, you might be surprised what you learn. 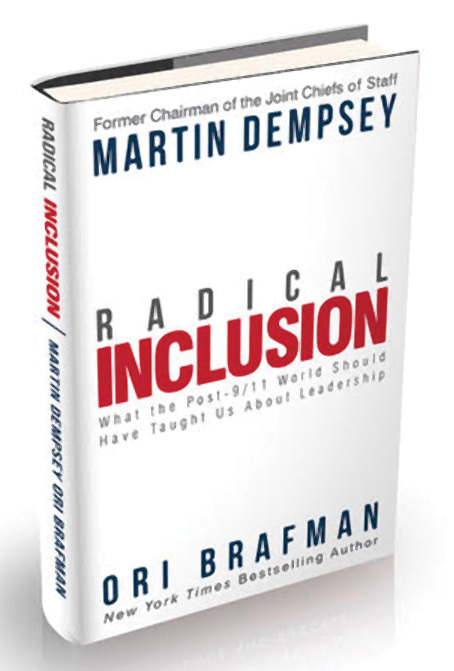 Martin Dempsey, a retired U.S. Army general, is the co- author of Radical Inclusion: What the Post-9/11 World Should Have Taught Us About Leadership with New York Times bestselling author Ori Brafman. Dempsey has a master’s degree in literature from Duke University, where he wrote a thesis on the Irish literary revival. He was inducted into the Irish America Hall of Fame in 2016.